If you are a fan of the show Parks and Recreation, you may enjoy this oral history of the “Cones of Dunshire” board game which appeared a few episodes ago. The prop department worked with the game makers of “Settlers of Catan” to come up with this delightfully-complex (but unfortunately fictional) game. Do you like the movie Alien? Here is a collection of behind-the-scenes footage from Alien compiled from dozens of bits of home movies. This isn’t the slick and sterile footage intended for a DVD featurette; this is just raw footage shot for personal use and which hasn’t really been seen until today. 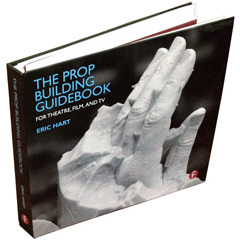 Stephen Magazine recently did an article on the Theatre Calgary props warehouse. They talked with props master Lillian Messer who showed off their well-stocked inventory and explained where they find their pieces. Iñaki Aliste Lizarralde makes delightful hand-drawn floor plans of apartments from television shows and films. See the furniture arrangement in Monica’s apartment from Friends, or how the rooms are connected in Frasier’s grand apartment. Even the smallest TV apartment is far more spacious than any I have ever lived in. Set decorator Stephenie McMillan passed away this week. She got her start working on films in 1984, with her most notable credit as the set decorator on all eight Harry Potter films. Check out this interview with McMillan from last year to learn more about her work and her process. If all the glues and adhesives out there are confusing to you, Design Sponge has an “adhesives 101″ for you. It does a good job breaking down the major types of glues available and what they are useful for. Of course, you should always test the specific glue you want to use first, but this guide is helpful to give you a place to start. Check out this massive behind-the-scenes photo gallery of the first Alien movie. The models and miniatures used on that film are incredible. Kamui Cosplay has a detailed look at how she created some fantasy armor from World of Warcraft using Wonderflex, Worbla, Friendly Plastic, PVC and EVA foam. This looks like a great method for making papier mâché clay. You mix up a bunch of pulp from egg cartons and magazines, then form it into balls which you can store until needed. Hat tip to Seán McArdle for pointing me to this wonderfully illustrated guide to Louis-style chairs. Check out this one-day build where Adam Savage builds Han Solo’s blaster. It’s well over 16 minutes long, so fire up some popcorn and settle in. My latest magazine article is out. In “Printing a Set“, I talked with several set designers who are using 3D printing technology as part of their process. Here’s an interesting story. Some soldiers in Afghanistan were having trouble carrying and reloading ammo for the new guns they were issued. To improvise a solution, they were inspired by a prop which Jesse Ventura used in the film Predator, and set out to recreate it. It worked. The title of this article says it all: Dexter’s Prop Master Tells How He Made the Show’s Most Gruesome Set Pieces. It is fairly gruesome, so I caution clicking through if you do not want to read about severed body parts and other macabre details. Here is a local news article on Karl Luthin, the owner of KEL Equine Productions, an Illinois-based company which has provided historically-accurate equine props, horse wranglers and set dressing to the film industry for years. His latest work will be seen in the upcoming Lincoln film by Steven Spielberg. You have probably seen his props in films such as “Glory,” “The Patriot” or “The Last of the Mohicans“. Check out his webpage too, for photographs of many of the items he has. You can find pictures of early variations of the game Monopoly (known as “Landlord’s Game”) as well as rules and other historical facts here. There are over a dozen variations spanning from 1903 to 1939. 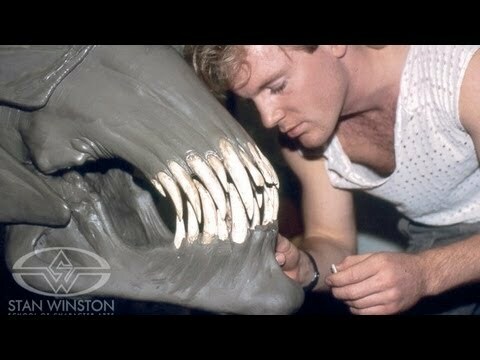 Finally, I like this set of behind-the-scenes photographs from the original Alien film. It’s just a guy chilling in a monster costume, whatever.